In every country you may be robbed, but in Western Europe the worst reputation in this matter has Italy. It may be because of the scores of Mafia movies we watched but you have to be careful anyway. Thus, when we with my wife Janina decided to take a trip to Italy, I suggested to her that she leave all of her expensive adornments such as necklaces and other jewelry at home. I warned her that I wouldn’t be able to fight the Italian Mafia in the role of an aggrieved husband. My wife obeyed. However, destiny dictated that the protagonist of our biggest shock during the trip was me. On our trip from Venice to Florence and finally to Rome we consumed the variegated menu of cultural memories. Most of us were looking forward to the first experience with the ´Eternal City – Rome´ like our grandparents waited for their wedding night. To please us even more the bus drivers released the ´secret´ that our guide for Rome (a Slovak woman married to an Italian) not only knew everything about the places worth seeing, but also about one particular place where we could buy the cheapest postcards in Rome (and in two sets!). Well, they were partly right – for some people it is more important to send postcards than to be at the place shown in these postcards. Nevertheless, I promptly explained to my wife this was not our case. 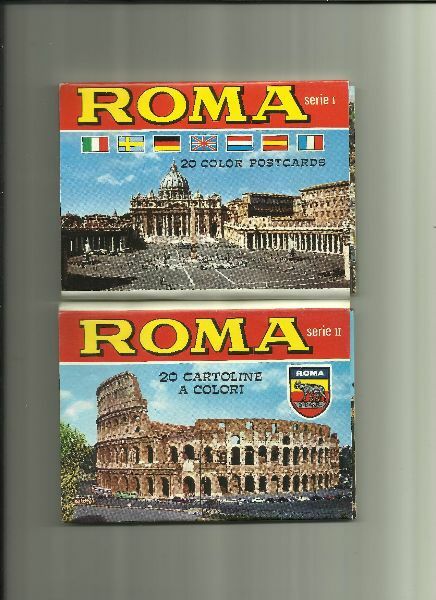 Although it is nice that all official representatives of the travel agency are trying to recommend to us the cheapest postcards of Rome (and allegedly one in two sets), but an experienced traveler must know that these cards are good for nothing. I also reminded to my dear wife of the well-known fact that I have immunity against mass-market psychosis. Therefore when our guide in Rome finally appeared and began our tour through the city with her first comment aimed to the cheapest postcards, I only smiled indulgently and reminded my wife that we were not here to buy postcards, no matter how cheap they might be. She agreed and, anticipating the attractions of Rome, I forgot all about postcards. fact, I was surprised that our passive group of tourists turned into a gang rushing to the postcard stand. I was doubly surprised by the fact that I was in its vanguard! This wave of eager consumers of totally unusable postcards carried me along with an irresistible power. And how to oppose the old man selling the postcards? In anticipation of these sales, he was stepping in front of his stand with delight. I was the first one there! He quickly pushed into my hands two sets of postcards (Don’t forget to check that they are marked Roma I and Roma II!) and I gave him my money as did those who followed. But I soon found that I had two sets of Roma I, so I returned and fought for the old man’s attention. He quickly changed one set of postcards and, exactly in this moment, the main mas of fanaticized tourists of our group separated us. It gave me an opportunity to look behind and contemplate the mass hysteria that was fascinating. A few meters from the old man’s stand, other sellers were hopping up and down proclaiming that they had the same postcards for the same price. But no one cared until the old man sold out. Then the ecstasy was over and our guide managed to press us back to our bus to visit other churches and monuments. I was shocked at the whole experience – mostly at myself. However, in the next basilica, St. Maria Maggiore, looking at the frescoes on the walls, I was comforted by the idea that it was an experience, but not an expensive one. At this moment I broke into a cold sweat. That morning I had changed our money and I had no small notes. What I´d stuck into the hand of the postcard seller in a hurry were all our money for the next days! To buy two sets of postcards that you don’t want is somehow unique; but to buy them at hundred times of their value?! When I told this to my wife, she almost fainted. She knew that I’m always lost in any business at home, but she had never dreamt – even in her worst nightmares – that my talent could be international. And then, while the women from our group comforted her by saying things like ”with a man you can find worse things,” I went to the guide. If I’m going to commit financial suicide, then I want to do it perfectly. I asked her to return to the postcard stand. Our whole entourage promptly voted to return to the renowned – now really renowned – church to see an attraction that was unscheduled and unpaid for. When I got off the bus, which unfortunately could not get now to the square right before the church, I was accompanied by the schizophrenic views of our tourist group fellows. By one eye they regretted what happened to me and by the second twinkled by expectation with of how long nose I will return. The guide and I stepped up of the never-ending long upstairs to the church like two mourners. After terribly long while we saw the stand from a distance, but the old man was nowhere in sight. It looked as though he had vanished with the cash. Who might be surprised for him. Beaten, we came to the stand and looked around. Then we found the old man. He was sitting on a very small chair under the shade of his counter and reading a newspaper, almost imperceptible because of his tiny size. He asked what we wanted. I have no idea what the guide told him, but she spoke as fast as machine gun.